Admissions Open at Swedish College of Engineering and Technology's Main Campus for the batch Spring 2018. SCET offers admissions in different fields of study for Bachelor Programs. 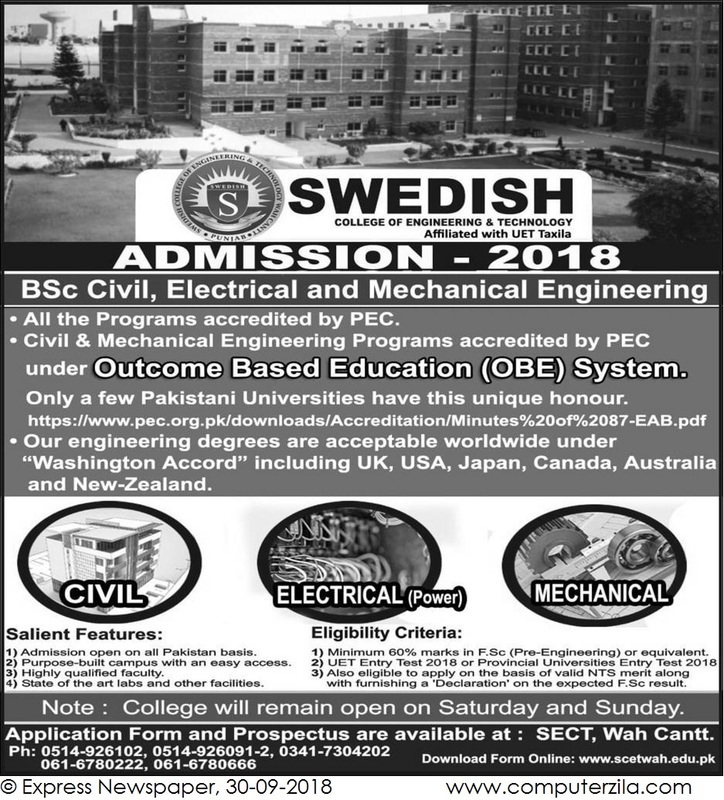 Swedish College of Engineering and Technology Offers Admission in Bachelors Civil, Electrical and Mechanical Engineering. University DescriptionSwedish College of Engineering and Technology (SCET), Wah Cantt was established in 2009 under Al-Asar Gujranwala Technical Education Society for the promotion of technical education in the country. The trust has been running eleven technical institutes for the last 20 years, thus catering for the needs of skilled manpower for the growing industry of the country and abroad. With this experience in delivering technical education. The institute is affiliated with the University of Engineering and Technology (UET), Taxila. All the three programs have been accredited by Pakistan Engineering Council. On successful completion of program requirements, engineering degrees are awarded to SCET graduates by UET, Taxila.